His highly regarded expertise has been applied to biomedical science and engineering (cardiovascular, dental, orthopaedic, and ophthalmologic), as well as environmental science and engineering (aerosols, sea surface, surface fouling in seawater and freshwater). Professor Baier emphasizes that many seemingly diverse fields are but a single field when attention is focused sharply enough at the various boundaries between solids, liquids, and air. A common feature often found is that the boundary interactions are dominated by interfacial layers of biological origin. Thus, advances in applications of materials at biological interfaces will be achieved more rapidly if individual gains from previously isolated disciplines, all of which involve biological interfacial phenomena, can be integrated. To find out how Mother Nature does it, he has studied the surfaces of porpoises and killer whales as "research partners" at various research aquariums, using the same analytical methods on the living surface layers of these mammals as he first applied to human skin, teeth, and even to human blood vessels. He and his team have worked with U.S. companies to develop several medical devices that subsequently were approved by the Food and Drug Administration, including a peripheral vascular graft, ophthalmologic comfort solutions, and ventricular assist devices. As a biomedical engineer and biosurface chemist, Baier notes that “we shouldn't poison our patients under the guise of keeping their plumbing clean. We must consider the same options for the external environment.” Indeed, his work with the U.S. Navy and coatings manufacturers have resulted in significant successes to reduce marine bioadhesion from ships, using formulations similar in almost all respects to those that that were used in the artificial heart. Beginning as a surgical technician operating heart-lung machine and dialysis equipment at the Buffalo General Hospital in 1959, he progressed through Bachelor of Engineering Science (Physics, Cleveland State University) and Ph.D. (Biophysics) degrees to post-doctoral training as a National Academy of Sciences fellow (Surface Chemistry) in Washington D.C. (1966-68). 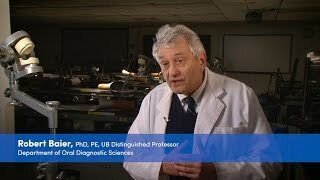 Dr. Baier spent sixteen years on the professional research staff of Calspan Advanced Technology Center prior to joining University at Buffalo full time. He was Executive Director of the New York State Center for Advanced Technology in Health-care Instruments and Devices (1984-1989), and continues as Executive Director of the Industry/University Center for Biosurfaces, which was sponsored by the U.S. National Science Foundation for two decades. He is extensively published in many areas of biosurface physics, particularly involving dental and medical implant technology. He was awarded a Doctorate in Odontology (Honoris Causa), Lund University, Sweden, 1994, and was elected founding fellow of American Institute for Medical and Biological Engineering in 1994. He is a Past President of the Society For Biomaterials (U.S.) and a Fellow of the International Union of Societies of Biomaterials Science and Engineering. Baier’s 30-year service in the U.S. Naval Reserve and numerous research reports and publications for military sponsors from his position at Cornell Aeronautical Laboratory (later, Calspan Advanced Technology Center) focused on intelligence and defense measures for chemical/biological defense. He is a licensed Professional Engineer in the States of New York and Ohio. According to Science Citation Index, other researchers have cited Professor Baier’s work more than 2700 times since 1966. His most cited paper over the past 45 years is “Adhesion: Mechanisms that Assist or Impede it” (Science 162:1360).